Billericay is nothing if not a town with history and character. From the Romans to earlier settlers in the Bronze and Iron ages, Billericay has always been a place people love to call home. Perhaps it’s no surprise then that the picturesque town has many gardening delights on display. From the boating lake at Lake Meadows, to the meticulously well-kept Billericay Cricket Club, this town is full of beauty and greenery, and we’re proud to help keep it that way. We offer both commercial and residential grounds maintenance in Billericay and surrounding towns such as Burstead, Ramsden, and Heybridge. So if you’re local and want a great service from a team who really understand the area, why not instruct Ricky Tyler Landscapes to help you realise all your gardening and landscaping needs? Regarding our business and commercial services, we offer a whole host of services including grounds maintenance and commercial landscaping. Our extensive experience in the area means we have offered our services to all kinds of local organisations including schools and businesses, landlords and local authorities – in every case, we keep our prices low and our loyal customers happy. Furthermore, we always aspire to top any other genuine quotes, and rapidly provide stunning results without hurting your pocket. At Ricky Tyler Landscapes, our meticulous passion and expertise means you are sure to be delighted with the results. 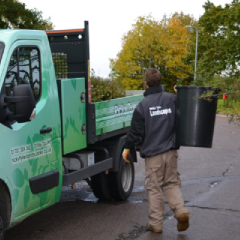 Whether you require commercial landscaping, grounds maintenance or other services such as tree works, facility services, and fencing in Billericay, Ricky Tyler Landscapes never disappoints. Our business is not limited to commercial offerings, and we also provide a comprehensive residential and domestic landscaping service to fulfil your gardening dreams for your home. Whether it’s a simple bit of garden maintenance you’re after, complete lawn care and turfing, or even driveway and patio refurbishment – you can be confident that Ricky Tyler has the team to ask. In our decade in the business, we’ve serviced over 1,500 properties in Billericay and its neighbours including Brentwood, Basildon, Halstead, and Wickford. Our approach is completely tailored to fit you and your lifestyle, and we let you choose a weekly, fortnightly or monthly service plan that's ideally suited to your needs. In all cases, we give your space that wow-factor, but always let you enjoy your garden whenever the mood takes you. So if you require garden maintenance, lawn care and turfing, or fencing and spraying in Billericay and beyond, let Ricky Tyler Landscapes make it happen. Ricky Tyler Landscapes can provide gardening and grounds maintenance services including Billericay Grounds Maintenance covering Billericay, Essex .